08.08.17 Roger Morin won the seven-player August Houlton Open played at the Art Studio in Houlton on August 5th with 3.5 points in four games. Lance Beloungie took clear second with 3.0 points and Leonardo Cui and Ray Haines shared third with 2.5 points apiece. Here's the tournament report with crosstables. The tournament room at the August 2017 Houlton Open. The long succession of Houlton Opens, played at the Art Studio in Houlton, continue thanks to the hard work and dedication of organizer, tournament director, and, in this case, tournament winner Roger Morin. 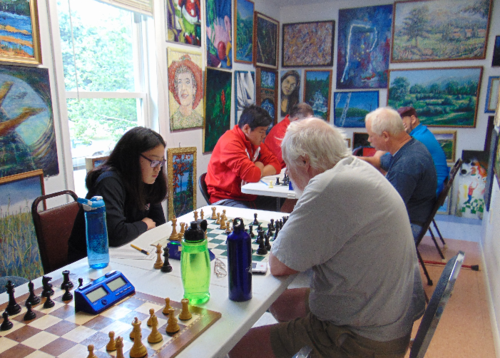 This seven-player G/65 tournament came down to the last round and the games between Roger Morin and Cynthia Cui and Lance Beloungie and Ray Haines. Morin and Beloungie both had 2.5 points and were vying for first. Beloungie managed a draw while Morin was able to pull out a win giving him 3.5 points and the tournament victory. Beloungie finished in clear second with 3.0 points. Leonardo Cui and Ray Haines tied for third with 2.5 points. Haines had the strongest start of any player with two wins in his first two games. Morin handed him a loss in round three and his draw with Beloungie in the last round gave him 2.5 points. Roger Peterson (2.0), Cynthia Cui (1.5), and Roger Hardison (1.0) finished in fifth through seventh places respectively. 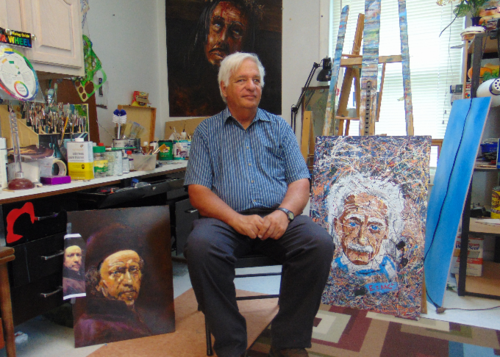 Roger Hardison sits with some heady company between rounds at the August Houlton Open.